few things that will help you to be prepared for the big day! 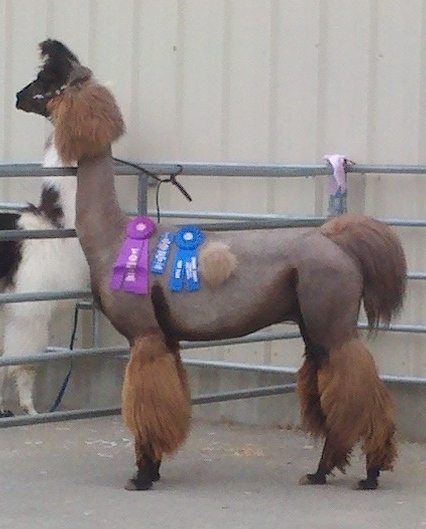 Llama showing etiquette calls for subdued colors (Blacks, Browns or White). The idea is to not detract from your animal, which for people that have shown horses is the opposite. The handler should wear black or brown slacks and a blouse that is in this shade range. A simple vest, blazer or sweater of these neutral shades may be added. The handler may chose to wear gloves, it is not a requirement, but it does look nice. Boots or some other closed toed shoe is appropriate for the handler to wear on their feet. If you have long hair, you should put it up as many judges like the entry number on your back. Keep your jewelry simple and not overdone, again you don't want to draw attention to yourself from the animal. How do I prepare my animal for the ring? I am going to start with how to train your llama to be shown in the ring. Do not wait until the week of the show to halter break your animal. Many people do not realize that when you show an animal that is not used to being led, they walk very different and it will 99% of the time cost you the class. You want to walk your animal many times before the show. Teach them to walk on a loose lead at a brisk pace next to your shoulder. This is called "moving out" and it makes your animal move a lot more naturally. Touch your animal all over to get them used to being touched before the judge tries. If a judge cannot get their hand on your animal, they may not be able to evaluate it for placings. Work with your animal on "squaring up." This is the stance your llama should assume whenever the judge asks you to stop. "Squaring up" refers to the placement of the llamas four legs. The two front ones should be together from the side view and from the front view they should have adequate spacing (if they are conformationally correct) and be toed straight. The rear legs should be also together from a side view and from the rear (again if they are conformationally correct) they should have spacing and be placed perpendicular to the llamas body. How do I groom my llama? This particular item makes me laugh. Some llama people will go to almost any lengths to clean or hide things. There are tons of groomer secrets, many of which I would not encourage you to do. Start at least one month prior to the show so as to not stress the llama to the point you cannot show them. I recommend a good bath with a Supergroomer and Cowboy Magic. Use QuickSilver on white llamas Following this I would blow Show Sheen into the llamas wool. This gives the llama a conditioning treatment and helps to repel dirt. If the llama has matted wool I recommend using a slicker brush to get them out. Pin Brushes work well on neck debris and may be used to brush an un-matted llama. If it is not too cold, I like to give a good shear job that enhances the llamas positive features (for example, you would never want to do a full body shear on a long backed llama). My favorite clippers are the Lister Showman as I can do almost any style of cut with them. A caution on using them would be to make sure your llama is very clean or you will wear the blades and motor out quickly. What do I do the day of the show? On the day of the show I would recommend going over the job you have already done with a finishing slicker (turquoise and white brush) and lightly wetting the llama down with Show Sheen. For a finishing touch I like to use black or clear hoof polish on the llamas toenails. If you have a llama with dirty white knees or a graying black llama, you can use Magic Black or Magic White for touch ups. Just before going into the ring, you may use a light coat of Static Guard (yes the clothing stuff) to keep the llamas wool from flying up. For an added touch you may decide to use a leather show halter, but that is not a requirement. A clean, neutral colored lead and halter are fine to use. What do I do in the showring? The key to showing a llama in halter is to make sure you are paying attention to the judge at all times. You also want to make sure you don't block the judges view of your animal. If the judge is in front of the halter class you want to stay on the opposite side of the llamas head (you only move from side to side by the llamas head without changing hands on the lead. The hands should always be: Right hand by the head and left hand holding the excess lead). So if the judge stands to the left of the line you should be standing to the llamas right side (facing the llama). If the judge is walking behind the line you should be on the same side. So if the judge were behind the line on the left, you would be to the left of the llamas head. If the judge walks around your llama individually, you want to keep one quarter away from the judge (visually split your llama in half through the middle from head to tail and around the girth area, thus giving you four quarters). If the judge is on the front left quarter you would want to be in the front right quarter. If the judge is on the back left quarter you would want to be on the left front side (or quarter). If the judge moves to the right front, you switch back to the left front side (or quarter). It sounds very confusing, but if you always remember you want to stand in the area that does not block the judges view of your animal, you will be okay! Work with your animal for at least a month prior to the show. Practice how you will groom them for the show and work on touching them and walking out. Make sure you dress conservatively and in a manner that accentuates your llama. The information written here is just my opinion and what has worked for me. You may discover your own shortcuts or tidbits on grooming.